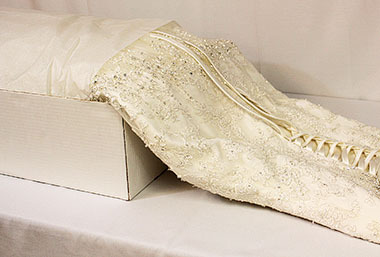 Following the thorough cleaning, anti-sugar treatment and final inspection of your wedding dress, we nestle your gown in a museum quality preservation chest. These preservation chests are completely acid free not just acid neutral, as with some preservation companies. 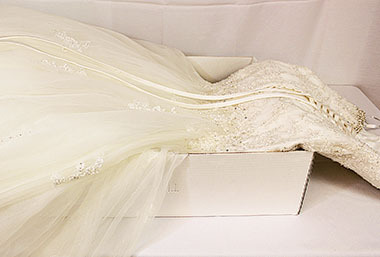 Your gown will be properly protected and preserved for best possible quality. We nestle your gown in a museum quality preservation chest. These preservation chests are completely acid free, ensuring the best protection for your wedding gown. Acid Free Tissue is added to minimize deep set wrinkles and creases to the gown. Acid Free Bust forms are also added to hold the bodice in place to prevent shifting in our preservation chest. Bead work inspected one final time. Your dress is carefully placed into the preservation box. The inner-lid features a window so that you can safely view your treasured dress.